Complimentary Nights Offer – Enjoy 7 nights for the price of 6 or 12 nights for the price of 10. Please contact us for further details. Well-designed and charmingly understated, Lily Beach Resort and Spa is celebrated for its astonishing setting and exceptional facilities. Whichever way you arrive at the resort, whether by seaplane or speedboat, you are guaranteed to feel like a celebrity with the sense of glamour and exoticism that exudes from Lily Beach and its transcendental backdrops. At Lily Beach you can have as peaceful or as action-packed trip as you please. With a selection of exhilarating water sports and a spa with an extensive portfolio of wellness experiences, there is something to suit every mood or fantasy. There is a range of guestrooms, from Beach Villas just steps away from the snow-white sands, to Lagoon Villas with open-air bathrooms and Deluxe Water Villas complete with ‘over-water’ living experience. If you’re seeking a holiday with unforgettable memories to be feasted on for a lifetime, look no further than Lily Beach in the sensational Maldives. Early Booking Offer – Book at least 60 days prior to travel and save up to 10% off. Honeymoon Perks – Including complimentary bottle of sparkling wine, wedding cake and local exotic flowers and more. Complimentary Nights Offer – Enjoy 7 nights for the price of 6 or 12 nights for the price of 10. Be intoxicated by the aromas of sensual massage oils that fragrance the air of the island sanctuary. Experience a spa like no other with mesmerizing scenes of the underwater world of the Indian Ocean through the floor’s glass windows. Entertainment – At night certain areas of the resort come alive with live music, traditional local music, music to dance to and night fishing. Gym – Working out on holiday is easy at the fully equipped fitness centre. Sports and Games – Play tennis at the flood-lit courts, or try a spot of table tennis, darts, beach volley ball, carom, billiards or pool. Kids Club – Activities and babysitting services for little ones. Pools – Take a dip in the two fresh water swimming pools. Diving – Keen divers and beginners may take PADI standard guided dives to some of the 40 plus exceptional dive sites in the local area. Those fortunate enough to visit the Maldives archipelago will experience some of the most stunning scenery on the planet, it’s no wonder this paradise is a top honeymoon destination. The Maldives is one of the all-time exotic honeymoon spots, with warm inviting waters, island idylls and near-perfect weather conditions, there isn’t much else left to be desired. Lily Beach Resort features contemporary Maldivian inspired architecture, natural materials and authentic indigenous artwork. The neighbouring area is ready and waiting for you and your partner to explore together. The gentle shallow waters of the lagoon are ideal for swimming in and catching a glimpse of brightly coloured tropical fish through the eyes of a snorkel. Walk hand-in-hand through the abundant flora and fauna, which colourfully ornaments the resort. 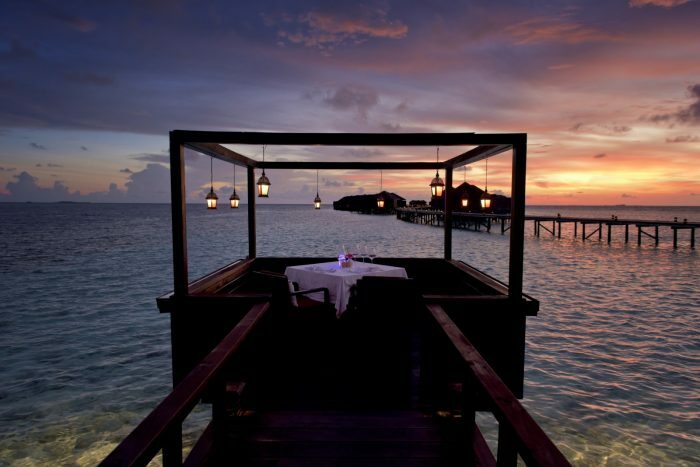 The exuberant Maldivian islands comprise some of the most captivatingly romantic territory known to man. Lily Beach Resort welcomes you to fully unwind in unpretentious surroundings, in an intimate resort with just 119 accommodations where privacy, peace and good service are paramount. Whether you are in the mood for international classics such as steak or burgers, or something more exotic like a local curry or traditional Maldivian fresh tuna dish there is something to suit every palate. Lily Maa – Relax in the balmy Maldivian air, as you look over views of the lagoon at Lily Maa, serving all day buffets from live cooking stations. Tamarind – Aptly named after the sour fruit popularly used in Asian cooking, Tamarind provides an array of aromatic Indian and Chinese delicacies. The Spirit – A laid-back beach bar, where guests can literally feel the sand between their toes as they browse the tempting list of drinks and snacks. The Wave – Fine dining restaurant serving fresh seafood and lobster, provides the perfect place for a special meal with your loved one.